If you’re in charge of a side dish for a last summer barbecue, this is a great option. Keep it in the fridge until you’re ready to eat, and if it’s going to be sitting out in the heat, consider surrounding the bowl with some ice. Cook pasta according to package instructions. Drain and rinse under cold running water to cool. Set aside. 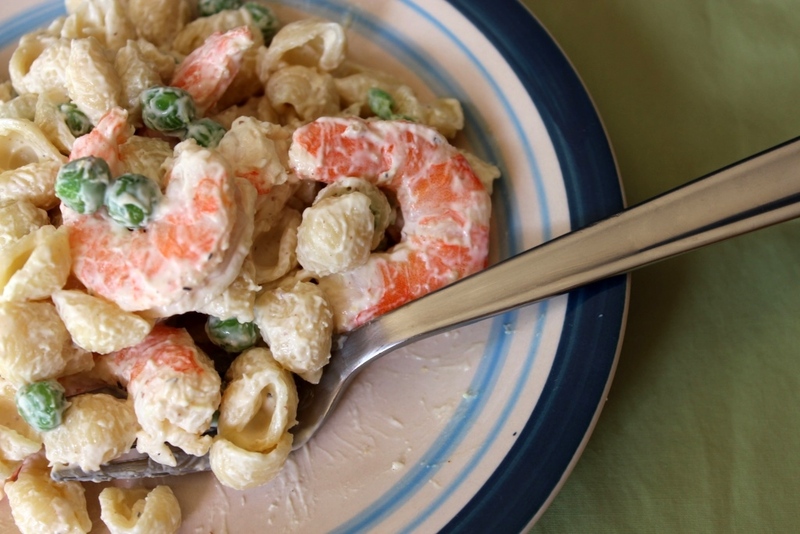 In a medium serving bowl, combine all remaining ingredients except peas and shrimp. Stir until well combined and smooth. Using a large spatula (rubber scraper), gently fold in the macaroni, shrimp and peas until completely mixed. Chill in the refrigerator until ready to serve, at least two hours.